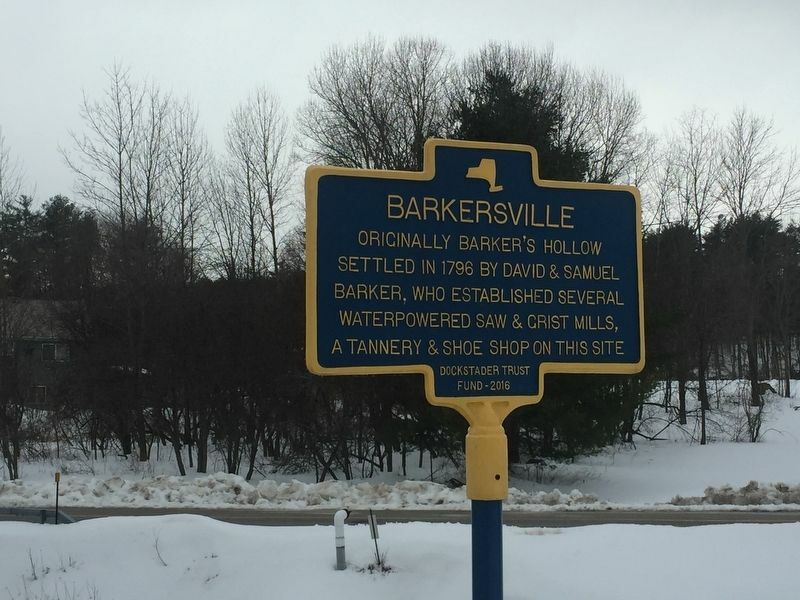 Originally Barker's Hollow settled in 1796 by David & Samuel Barker, who established several waterpowered saw & grist mills, a tannery & shoe shop on this site. Erected 2016 by Dockstader Trust Fund. Location. 43° 5.335′ N, 74° 2.313′ W. Marker is in Barkersville, New York, in Saratoga County. Marker is at the intersection of Barkersville Road (County Route 16) and Fayville Road (County Route 13), on the left when traveling north on Barkersville Road. Touch for map. Marker is in the triangle formed by these two roads. Marker is in this post office area: Middle Grove NY 12850, United States of America. Touch for directions. Other nearby markers. At least 8 other markers are within 6 miles of this marker, measured as the crow flies. A different marker also named Barkersville (about 800 feet away, measured in a direct line); A Plow Factory (approx. 2.1 miles away); Old Baptist Meeting House (approx. 3.1 miles away); The Gere House (approx. 3.1 miles away); Galway Village (approx. 4.9 miles away); Seabury Mills (approx. 4.9 miles away); Hans' Creek (approx. 5½ miles away); Sacandaga Pike (approx. 5.8 miles away). Barkerville used to be the site of a tuberculosis asylum. It is a couple of miles past Barkersville, and now rapidly disintegrating. Credits. This page was last revised on March 16, 2019. 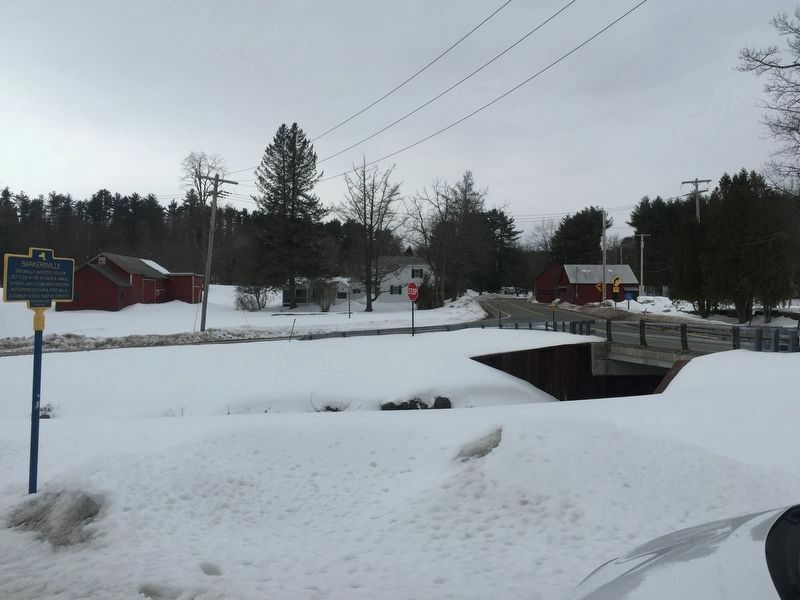 This page originally submitted on March 13, 2019, by Steve Stoessel of Niskayuna, New York. This page has been viewed 53 times since then. Last updated on March 16, 2019, by Steve Stoessel of Niskayuna, New York. 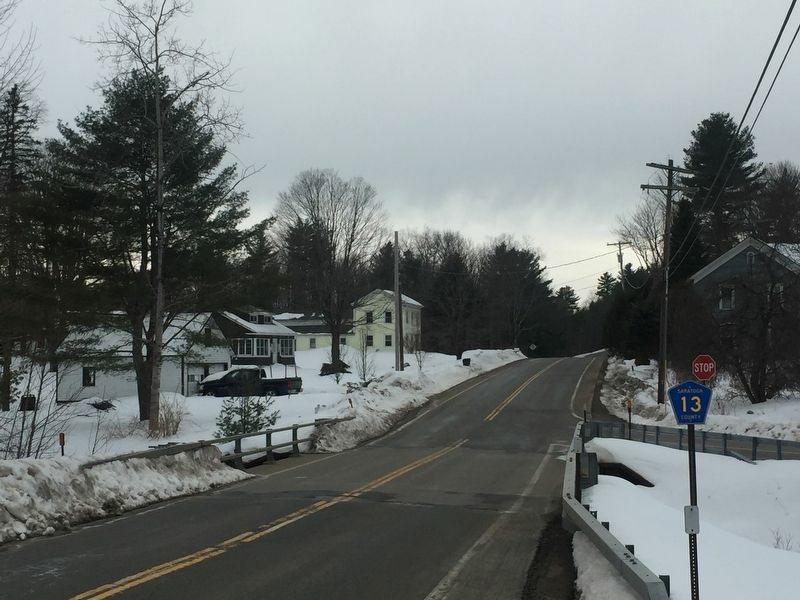 Photos: 1, 2, 3. submitted on March 13, 2019, by Steve Stoessel of Niskayuna, New York. • Andrew Ruppenstein was the editor who published this page.